There’s nothing like a really good piece of meat, seasoned well, and grilled on a warm summer night. 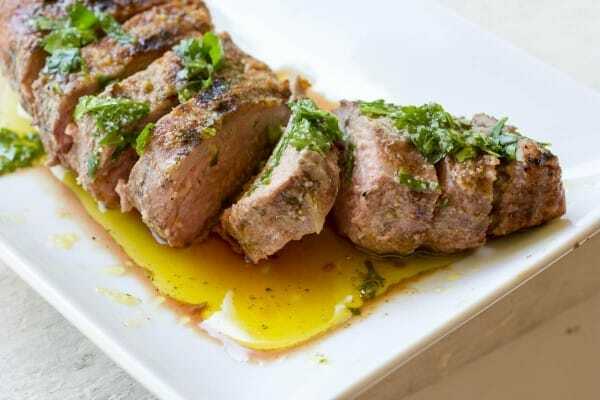 This Grilled Pork Tenderloin with Fresh Herb Sauce is juicy and tender and cooks in 15 minutes. Quick and easy and did I mention EASY has been the name of the game around here lately, and this meal was no exception. 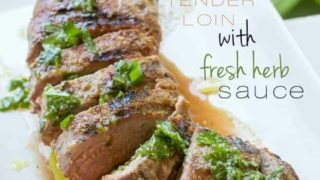 Pork tenderloin is one of my favorite pieces of meat to toss on the grill, and this grilled pork tenderloin with fresh herb sauce was one of my favorite meals of the whole season! 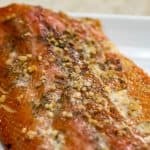 Need an easy father’s day dinner? You found it! We got these pork tenderloins at Costco. This is another creation made especially for you all by my awesome husband and best friend and new blogging partner – Jeremiah. He’s got the cooking and is making some serious strides on the food styling. 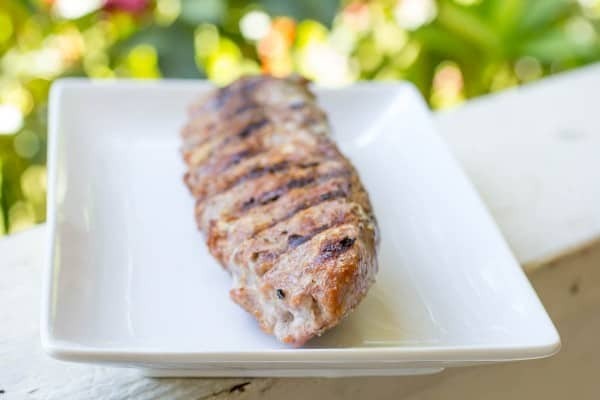 The key to pork tenderloin is to NOT OVERCOOK it. 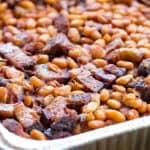 Its a super lean, quick-cooking cut of meat, and it also continues cooking for a few minutes after you pull it off the grill. Another key to keeping your tenderloin juicy is to let it rest for about 10 minutes after you pull it off the grill. Cutting into it will release the juices before they’ve redistributed back into the meat, and that’s never good. You want the juices in your meat – not on your plate. The fresh herb sauce is such a fresh and bright complement to the meat. It is almost a chimichurri but is lacking the typical acid/vinegar that makes that sauce unique. Serve with my easy cheesy orzo, my perfect grilled asparagus, or a big salad with my Greek Freak Dressing. There's nothing like a really good piece of meat, seasoned well, and grilled on a warm summer night. 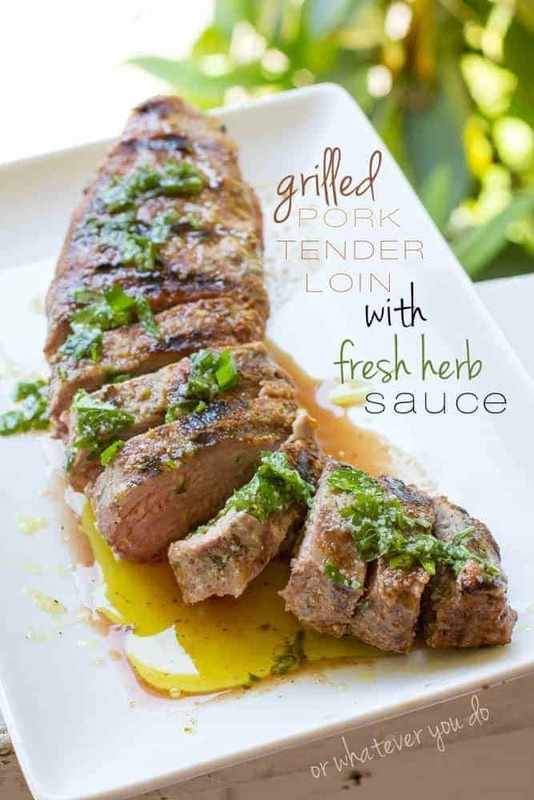 This Grilled Pork Tenderloin with Fresh Herb Sauce is juicy and tender and cooks in 15 minutes. Preheat grill to medium heat. Remove any silver skin from the tenderloin that is remaining, and pat it dry with paper towels. Liberally coat the tenderloin in my DIY BBQ Seasoning, and then cook over semi-indirect heat on your grill. Turn the meat frequently to ensure even cooking, and temp the meat at about 15 minutes to ensure its reached 140-145 degrees. Its okay if its a bit pink on the inside. That's normal, and safe. 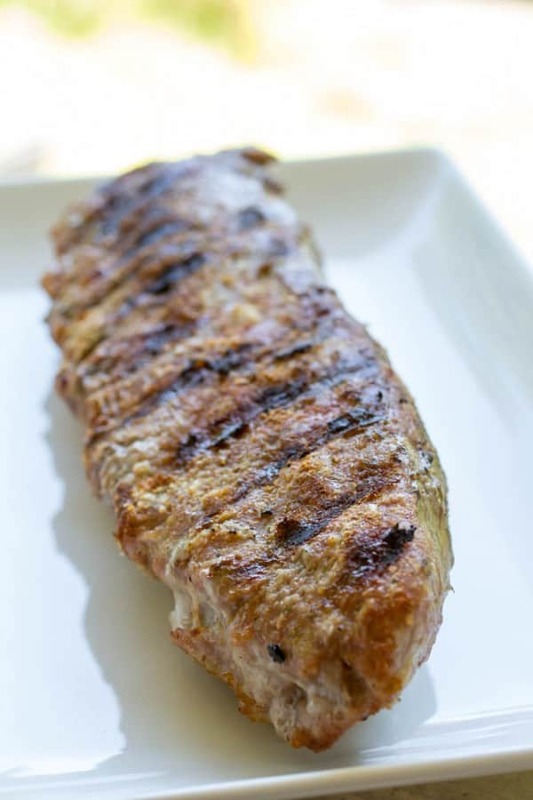 Remove from the grill and let rest for 10 minutes. While the pork is resting, make your herb sauce by placing all of the ingredients into a small food processor and pulsing a few times. You can also do it by hand by just finely chopping the herbs and mixing in the oil and salt and garlic powder. Slice the meat diagonally, and spoon generous amounts of the herb sauce on top. 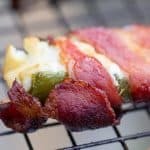 I think not overcooking is the key to a lot of grilling! A woman told me earlier this week that is is actually better at grilling than her husband because he tends to overcook everything! 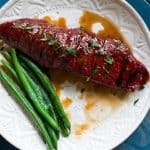 This pork tenderloin sounds delicious! Thanks, Tonia! I totally agree on grilling. 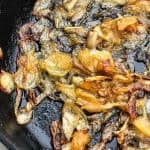 Most people overcook things I think! This is fabulous, Nicole! 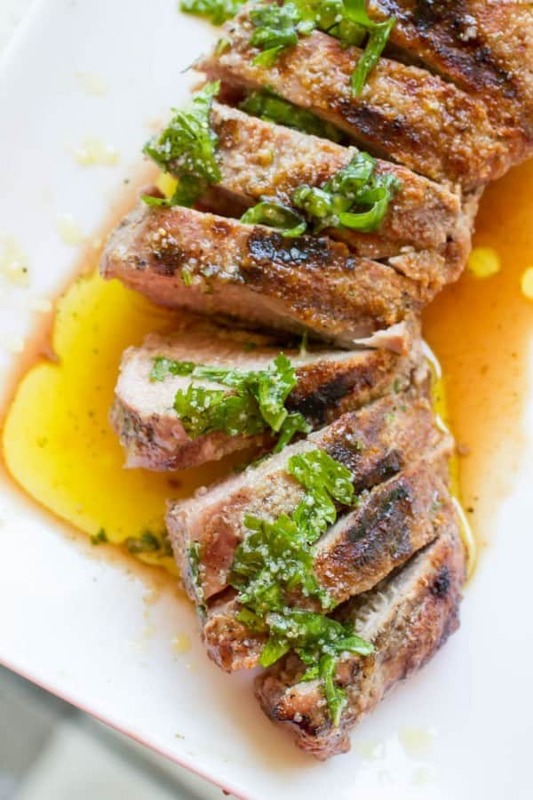 You said it, pork tenderloin is so easy to overcook. I think this is why I have never made it on the grill. I really like it on the grill. My husband usually does it though! He’s a much better griller than I am! We ea a LOT of pork tenderloin in our house. I love new variations like this one! Thanks for stopping by, Kim! I appreciate it! 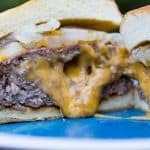 That fresh herb sauce sounds amazing – wishing I could reach through my screen for a bite right now! I love it when photos do that! The good part about this one is that its so easy to make! 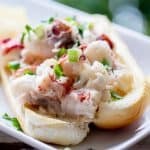 Mmm, I love how simple this recipe is yet SO delicious too! 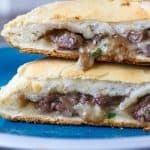 I’m so adding this to my list of easy dinners! That was one of my favorite parts of it too. <3 Thanks for visiting, Laura! That is one gorgeous tenderloin!! Thanks, Jaren!! It was really good!